The projected cost of the Parkway is over $3,000 for every household in Peterborough. That means raising taxes, increasing debt, and/or putting other important city projects on the back burner. The Parkway is little or no more effective for moving future traffic than options that leave our greenspace intact. Other options do a better job of connecting new areas of development to where people work. The jewel of the city, Jackson Park, will be irreparably damaged by a four-lane bridge that few want. The Parkway corridor trails and greenspace are key to the quality of life we all love and that attracts families and employers to our community. The Parkway will remove over one third of North-end Greenspace. The Parkway has been a contentious issue in Peterborough for many decades. It was turned down by 55% of voters in a referendum in November 2003. Following that vote, City Council ordered the Chief Administrative Officer to have the Parkway removed from the Official Plan. This did not occur. Why was the voice of the people not respected and the why was the direction of Council not acted upon? 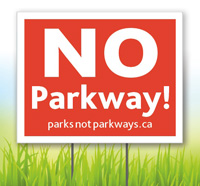 If you agree that paving the Parkway and building bridges thruogh our parks are bad ideas you must Act Now and Tell Council! Tell your friends about our campaign and send them links to this website. Show your support by joining us on Facebook.